One of the biggest headaches for external portable DVD drives is the restrictions to play disc of multiple regions. A RPC2 type will restrict a maximum change of region to 5 times. This is typical of the latest Macbook Air superdrive. One wonderful alternative which I’ve got in the recent IT Show was Imation IMN-600LE DVD drive/writer. It is a RPC1 type and now I am able to play discs of different regions without any imposed restrictions. And the other beauty of it, its cheaper at S$55 vs $98 for the superdrive, though the latter is better built and more presentable. 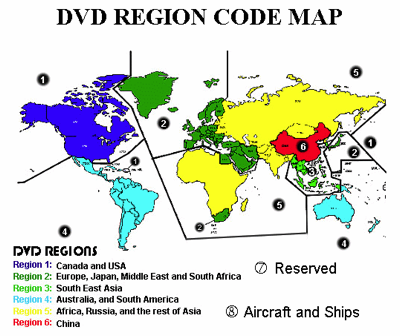 DVD region codes are a DRM technique designed to allow motion picture studios to control aspects of a release, including content, release date, and price, according to the region. DVD video discs may be encoded with a region code restricting the area of the world in which they can be played.The DVD Copy Control Association in California, USA, requires that DVD player manufacturers incorporate the Regional Playback Control (RPC) system – according to the Australian government’s anti-monopoly watchdog, the ACCC. It is therefore this US Association that is responsible for the RPC system that effectively divides the world into six regions for the purposes of controlling and manipulating distribution within the global DVD market. Informal term meaning “worldwide”. Region 0 is not an official setting; discs that bear the region 0 symbol either have no flag set or have region 1–6 flags set. International venues such as aircraft, cruise ships, etc. Region ALL discs have all 8 flags set, allowing the disc to be played in any locale on any player. RPC1 is a scheme that makes the playing software manage and control regioned playback. An RPC2 drive will limit the number of times you can switch between on the drive. Once you consume your 5 changes, you will be unable to view a disc in a different region. If you own a DVD library containing many different regions (ie imported discs from Japan, USA, etc.) this is clearly a problem. One resolved by using an RPC1 drive.